Does having eternity in your heart mean that you know God and are His child? Could Gentile cultures understand the Gospel from the stars? Did God create man�s cultures? Has God always been in the process of redeeming cultures from the time of Babel by placing in them a true revelation of Himself? Is there the worship of YHWH in all cultures and religions through the names of �supreme beings�? Have all cultures always had a way to make things right between them and God? 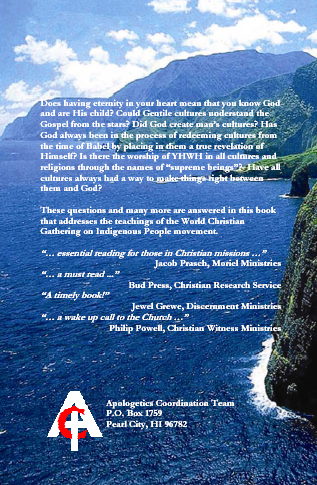 These questions and many more are answered in this book that addresses the teachings of the World Christian Gathering on Indigenous People movement. 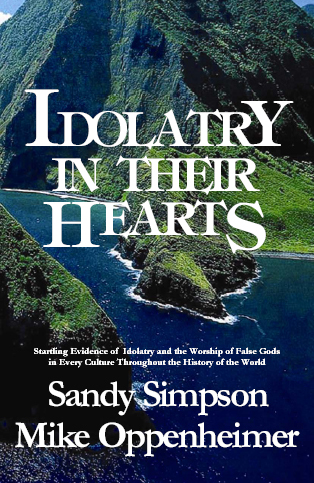 Idolatry in Their Hearts is the result of Sandy and Mike's tireless, landmark research into one of the most deceptive and heretical movements of our day--the Indigenous People's Movement. Pastors, laymen, and missionaries in foreign countries should strongly consider this book a Must Read for 2007. A timely book! In the plenary session at the Urbana "mission" conference, they had two Pacific Island girls doing a hula dance to a native Hawaiian deity called 'Io. It is time we call this for what it is! Idolatry In Their Hearts is essential reading for both those involved in Christian missions and those who support Christian missions to tribal peoples at a time when the firm Biblical standards of �I AM THE LORD YOUR GOD YOU SHALL HAVE NO OTHER GODS BEFORE ME� is under an almost systematic erosion. In light of the current apostate missiological philosophies being propagated by C. Peter Wagner, Danny Lehman & the Youth With A Mission organization, and others ready to wrongly identify the God of the Judeo-Christian scriptures with pagan deities in the name of an unbiblically redefined evangelicism, the message of this book is vital to the contemporary church of Jesus Christ. Having been greatly benefited by their watchman ministries (http://www.deceptioninthechurch.com ) and particularly through their DVD video series (http://www.deceptioninthechurch.com/wcgip.html) exposing the errors of the World Gatherings of Indigenous Peoples I keenly await Sandy Simpson's and Mike Oppenheimer's new book Idolatry in Their Hearts. The title, being a take-off of Don Richardson's Eternity in Their Hearts, implies setting the record straight from a Biblical and Church History perspective. Thankfully others are awakening to the extreme missiological error of the World Christian Gathering On Indigenous People movement as expressed through YWAM and others. For example the New Tribes Mission states: �Those who stress culturally felt needs as the key for understanding and accepting the Gospel are confusing the results and the blessings of the Gospel with the Gospel itself.� IDOLATRY IN THEIR HEARTS goes further than this and is a wake up call to the Church at large to return to the pure preaching of the true Gospel. Well done, Sandy and Mike. IDOLATRY IN THEIR HEARTS is available now for $18.00 plus s/h in the US. Non US Postal addresses are $18.00 plus s/h to Non-US. This is a 414 page book. Order by PayPal by clicking on the PayPal shopping "Add To Cart" button or by mail by clicking on the "Order By Mail" graphic and printing out the orderpage on your printer! BOOK - U.S. BOOK - OUTSIDE U.S.
Now also available in eBook format. Only $8. Click on the button below to order. This book, Idolatry In Their Hearts, is in Adobe PDF (.pdf) format and will be delivered in a WinZip (.zip) file. Simply unzip it and read it with Adobe Reader. Only $10. Click on the button below to order. This book, Idolatry In Their Hearts, is in Kindle .mobi format. 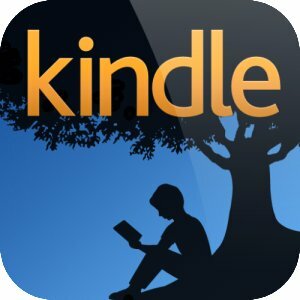 The advantage of using this version with a Kindle e-reader is that you can change the size of the text, background color, etc. The disadvantage is that it doesn't have a clean formatting as the PDF version. After you download it you will find it in your downoads folder and you simply double click it to run it.